Some years ago I saw a version of this on Kaboose and thought these pony bead fish would make an appropriate project for Lent. 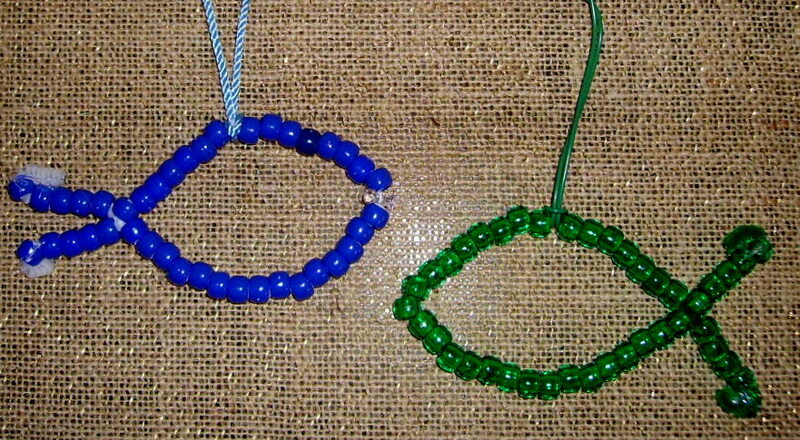 The 1st graders made necklaces from the pony bead fish. In the early days of Christianity, Christians were persecuted or even put to death because of their faith in Jesus Christ. So they devised a secret code that would identify themselves as Christian. More information on this project, “Pony Bead Fish Necklace,” can be found in the 1st Grade Projects Gallery in the sidebar. Click on the image for a better view of the project. This entry was posted in 1st Grade and tagged 1st grade, art projects for lent for children to make, lenten art, lenten art project, lenten project for kids, pony bead crafts for kids, pony bead fish, pony bead fish craft for kids to make, pony bead fish necklace. Bookmark the permalink.